We had the lights flicker a few times but our power always came back - how scary you lost power! That skirt is so stunning. I also am in love with that navy wrap. Especially paired with the pink Balenciaga. Those two are seriously two peas in a pod. Stunning Mica. Love that lacy skirt. I'm ready for summer now! I really like that blue wrap top and it goes so well with the skirt! They look like they were made for one another, isn't that funny how that works? I liked the shoes with the first outfit but you could change the shoes out next time and have a different look. That's what's fun about accessories, right?! Hope you have a fabulous week Mica and thanks for the link up! I'm not a big fan of wrap tops and dresses, but these two look absolutely lovely. I especially love how you styled the first outfit, the lace pencil skirt is gorgeous! Love the shape and draping of these tops! The look lovely with the skirts. Thanks for the link up! I really love the first outfit! That skirt is so pretty and looks so good styled with the wrap top! Thank you for the linkup! Have a great week! I like how the wrap stops "hang"...and the pencil skirts are so pretty. You know I'm a big fan of your bags!! Thank you for hosting this link up and I hope your week is off to a great start! Mica, I love the blue on blue of the first outfit! 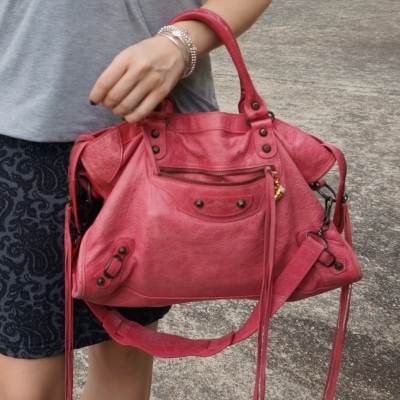 The saturated colors are so brilliant with the pink bag! Great looks! I love the pink bag with both of these outfits. And you are so smart to recreate your outfits like this!! Oh I LOVE the navy wrap top with the lace skirt! You probably know by now that's my favorite skirt of yours- such a great piece. And it's so perfect paired with the gorgeous pink bag. I adore the color of your Balenciaga bag and what a fun name! I would totally rock that with some neutral outfits too! I love wrap tops! I'll have to wear mine again and maybe add another one to my wardrobe this spring! Thanks for the link up! Hope your week is off to a good start! Love this style of outfit, definitely would wear this. Thanks for hosting Mica, have a super week. Beautiful and comfortable outfits, Mica. I'm drawing towards the first look. The colour of the blouse and skirt compliment each other nicely. Using outfit formulas to help you figure out what to wear makes getting dressed so much easier! Your navy wrap top and skirt look beautiful together! These are both winning combinations! Mica as you know i am a wrap top fan, being the blue one my fave! I really need to wear my skirts more often and pull out my pink bag! Now that spring is here, it is time! Got to love an outfit formula that work. I still madly in love with that first skirt. I bet by now you hit your 30 wears on it. gorgeous bag, love the color! Wrap tops are definitely a great alternative to a plainer tee like you said. I love how you styled both looks. The tops look great with the printed skirts. Cutest lace skirt! I adore it for Spring/Summer. your bags are always my favorite too :) Have a great week! That is such a chic outfit. That pink Balenciaga bag is so much fun! I have a smaller version in black! The colours look so lovely together. Have a great week. I love the skirt in the first look. The fit is perfect and skirts are my favorite to wear! Glad you found those tops, they are really lovely and look great paired with pencil skirts. Great office outfits. I always love jersey pencil skirts, they are so comfortable and easy to wear. I love the first outfit with the pop of colour! A fab work outfit. Makes me want to go back to work and dress up in clothes other than activewear or jeans, lol! haha it is nice to go into the office and get a little dressed up! I am in love with the bag as well as the skirt! Wonderful post! Thanks for sharing. I love the way a contrasting bag in a bright color totally cheers up a look! I just love the navy skirt. You look so great in a pencil skirt. That pink Balenciaga bag is a beautiful pop of color. I hope your week is going along very well my friend. That first outfit is my favourite - the pieces go so well together (and you know that's my favourite skirt of yours). The second top, while flattering, is kind of a dull colour on you - I like seeing you in brighter, more saturated colours. Your "bag game" is always spot on. Lovely! Thanks Sheila! I had my colours done and grey isn't one of 'my colours' but I love it so much I wear it anyway, haha! When I see that first skirt I always think how pretty a dress it would make! I love both outfits, the color palettes are so pretty and calming. The pink works perfectly in both. I love having an outfit formula too, it makes getting ready that much easier because you already know it works. Thanks for sharing and I hope you have a great rest of the week! I love what a difference one bright color can make. 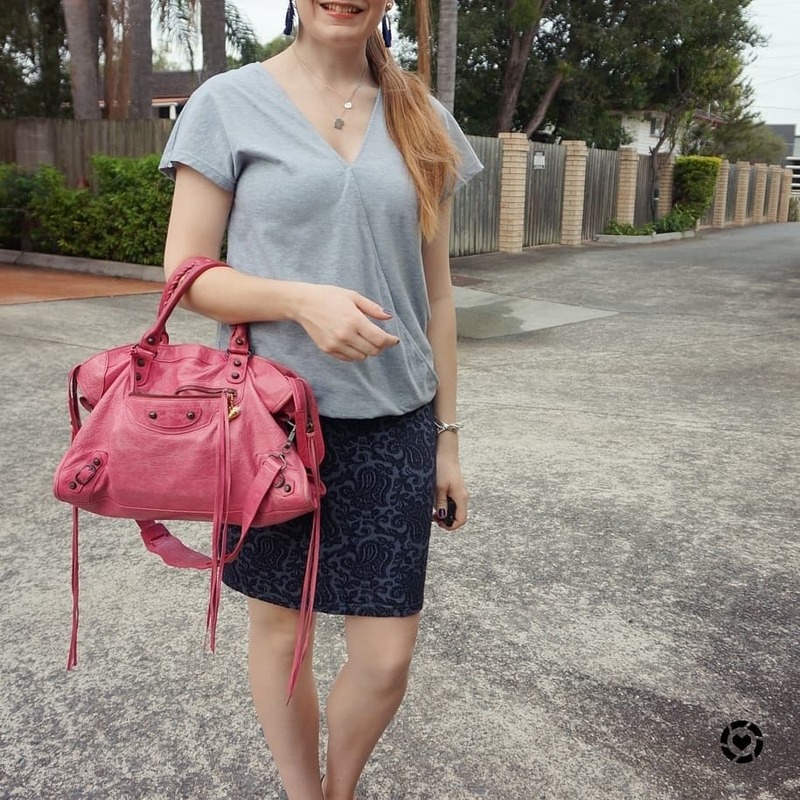 I love navy + cognac and navy + gray/silver, but the pink bag adds so much to the look! I love pairing my skirts with cute little tops! Being in education, I love style, but I also love being comfy! Those wrap tops look fantastic paired with those skirts. Love how the blue tones look with grey ones. You look fantastic. Those skirts are really cute, Mica! I love how sleek they are, and that pink Balenciaga! Stunning! Lovely look dear! The skirt is super cute on you. I especially like the color combo in the first outfit! 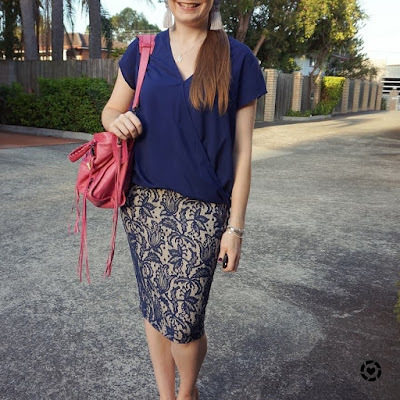 The lace pencil skirt has a very pretty pattern. The bag is such a fun pop of color to these outfits! I really need to try wear more of my wardrobe because I def wear the same like five tops all the time and I have SO.MANY. Nothing wrong with having go-to favourites! :) I'm just trying to mix it up a little now and then and wear some of my forgotten pieces! I love wrap tops and wrap dress. I think they are so flattering for any figure. Cute bag. Thank you for sharing this look with My Red Carpet.